The "land problem" has acquired a new urgency over the holidays. To believe the official story one would be lead to think that hordes of starved peasants, landless, desperate, are roaming the country is search of land so they can plant a little bit of yucca and plantain so their children will not starve. Passing fast on the obvious comment that how come that after 6 years in office Chavez has peasants starving, the truth of the matter is far distant from the chavista version of the situation. It would require a book to describe all what is going on in the Venezuela country side. Thus, to simplify matters I will split this in three parts. First I will refer the reader to a recent post by Miguel who describes quite well some of the judicial aspect of the problem. Then I have translated the editorial of El Nacional from yesterday (with the original Spanish there ). This is accompanied with rather lengthy notes to explain in more detail some aspects of the problem, as they are brought forth by the text. Finally I set up a table on the land distribution as far as we can know right now in Venezuela. This way the reader will be able by itself to decide what to think. With my very own opinionated opinion at the very end. Since it is a rather long assay I have added internal links to facilitate circulation between the different sections. The manner in which the bolivarian regime has been dealing with the land tenure problem has allowed for many ambiguities from the very beginning of the revolution. It has been more than five years since the government has promised a study of the essential lands to know where they are and which ones are of state or private ownership. It is a matter of order, of legitimacy for a state to talk with authority and trustworthiness. This was not done. The regularization of land holding is an old and dramatic Venezuelan problem (1). It does happen to all governments, they promise a survey, and later on they abandon it, never concluding anything. We are not, thus, in front of an exception, but in from of a predicted failure (2). According to official sources, the bolivarian regime has distributed millions of hectares among peasants. Can anyone inform how they are being administered, which are the results and the projections? Meanwhile, and what has been learnt, it has been a major failure in Guarico, publicized and shown on TV, where peasants accuse public institutions for cheating them by selling them corn seed contaminated with fungi. Harvests were lost, and so were lost the loans and, of course, the hopes that they had put in their labor. One does not need to be a rocket scientist to understand that few matters are as complex and depend on so many unpredictable factors as the agrarian production; that a special preparation is required to direct institutes such as the National Institute of Land [INTI]; that is not enough to have eaten arepa to know the complexities involved in growing corn (3). The problem of the State is that the President thinks that all his captains know everything and can do it all. From this to hit like a blind man with a stick is just a step away (4). Suddenly appeared fitful acts with the initiatives of the Cojedes governor "intervening", that was the word in the initial decree, a considerable number of haciendas, the famous hato Piñero among them, and also the fundo Charcote, property of a British company which is in full production, according to itsspokespeople (5). Governor Yanez Rangel called for a governor reunion, segregating the INTI, to ask not only for support, but also for imitation, that is, to act as he did. After these episodes some more got involved, vice president Rangel, the minister of Agriculture and Land, the president of INTI, who announced as one voice a reactivation of the "commando against latifundia" as if it were a major battle. Maybe so much heroism was unnecessary. What are needed is moderation, good sense and knowledge. Nobody wants them to remain with their arms crossed, but neither that they act as epileptics. May they know what they are doing because to govern is not to mock everyone and even less to deny people's rights. The governor of Cojedes has announced the creation of a commission that would have determined in a few days the situation of the intervened hatos. They did not wait. For example, the immediate intervention of El Charcote, an agricultural complex, better known as "the British company" was ordered. According to a communiqué from the Agropecuaria Flora, the legal name of El Charcote, the propriety rights can be traced to 1830, that is, to the foundation of the Republic of Venezuela. The spokesperson stated that they have given copies of this to the INTI of Cojedes as well as the Caracas office. In other words, they demonstrate the ownership "without any interruption and very clearly"(6). With the phlegmatic tone which is their trademark, a spokesperson from the UK embassy expressed that "what is important is that the law is respected in an impartial manner". This is what we all wish for. El Charcote will be the subject of a final intervention by the governor of Cojedes. The news was divulgated like a war report. "Saturday 8, at 10 AM, all the machinery of the sate, all the armed forces stationed within the state of Cojedes and its police force will be present at the installations of hato El Charcote to implement the first beachhead of mision free Land and Men". Not even Zamora had such words (7). (1) Writing an history of the Venezuelan Land problem is a near encyclopedic behavior. Here is a short run, completed in other notes. It started of course with the Spanish grabbing the land from the natives, through in part the system of encomienda. However this system did have an advantage: those who spoiled other folks from their land were rather keen in registering all their proprietary rights. By independence time all useful land close from inhabited centers was assigned in a wide variety of ownership schemes, from church lands to native lands in some areas. Including of course the gigantic estates such as those belonging to Bolivar himself. But the independence wars, often closer to a civil war than a freedom war had the result of massacring most of the colonial elite. Those who were not killed fled the country or abandoned their ancestral lands, few remaining on the job. The epigones of Bolivar came back to Venezuela and as a compensation often occupied the ancient ingenios and haciendas which often were abandoned or with a minimum of activity by the remaining slaves and peons. With the mess of 2 decades of civil disruption, property rights were often not clear and the new land owners were not too worried about legalizing the invader situation. Not mentioning that many of them, not particularly educated in what had become a semi barbaric rural habitat were only too happy to limit themselves to cattle raising. There was thus no particular need to settle propriety rights since the new owners had the force with them and land property was pretty much as far as their cowboys could reach to herd cows. The federal civil wars f the 1850-1870 period did not help. And the long lived an powerful dictators who followed (Guzman Blanco or Gomez) were not adverse to seizing a few haciendas for their own use, not necessarily under their name. (2) Many a government used agrarian issues to justify their access to power, since independence times even. Bolivar emitted a decree on that subject in 1817. But the first real concerted effort was the agrarian reform of 1945, greatly expanded in 1947 and finally applied in the 60ies with the Agrarian Reform law of 1960. The agrarian census of 1954 reflected only around 100 000 "owners" of what was about barely 25% of all of the agrarian lands. The rest of the land was owned as latifundia and worked by hired hands. The Agrarian Reform increased the number of land "owners" to 313 000 by 1985, though perhaps as many as 100 000 peasants were still claiming for land. (5)There is a number of terms to describe Venezuelan agricultural exploitations, not necessarily referring to the real size of the property. They start from "hato" which usually is considered large enough that some run into the acreage of a small European country. Then we have "fundo", "hacienda" to the smaller "finca" and "granja". Usually the names have a relation with the initial activity of the farm, in addition to its size. For example most chicken farms are referred to as "granjas". A "finca" is perhaps the closest to the term farm in its European sense, a few acres including a few fields and some cattle. "hacienda" has an old tenure connotation, a certain prestige even if the "hacienda" lost most of its glamour (and lands! )over the years. "hato" is mostly used for immense lands in the Llanos for cattle raising. One Spanish term not used is "rancho", widely used in Mexico. In Venezuela "rancho" is used for slums. (6)In the Byzantine land tenure situation in Venezuela, one must demonstrate the successive tenureship of the land from as long as possible. The many political disruptions in our history make it quite possible that you buy land from Mr. X who bought it from Mrs. Y 10 years ago and who can show something that looks like an official document. Yet, once you build a house or plant a crop, just at harvest time you can have a neighbor come and claim part of your land (and crop) or even a long lost heir from 30 years ago with a document that actually can void your property title. In such cases, after a lengthy and costly trial you will be lucky to recover part of your initial investment. This is actually not a rare scam, heirs staying quiet for years until somebody revalues a land that they refuse to work on. (7)Ezequiel Zamora (1817-1860) is one of the mythic heroes of Chavez. And he has distorted the story around him as much as he has distorted the story of Bolivar to suit his interests. Zamora was a successful shopkeeper that got dragged into politics when the post independence order established by Paez was challenged by the "Liberal" movement, which was very loosely more open to greater popular participation, although controlled by the same social class as the one in office. As a young man Zamora had been exposed to progressive European ideas and he became an advocate of landless peasants and a noted local agitator. But when the Liberals made it to office he was associated with its new benefits and left behind any notion of social revolution that he might have harbored. His first uprising was in 1846, and he forges his military skills until the final victory of his side in 1849. From then on he occupies diverse administrative posts and gets married in 1856 to a rich widow for whom he leaves public office to administer her estates in the Coro region. But in 1858 the Monagas regime falls and after a brief exile Zamora comes back to lead an insurrection in 1859. His military skills and leadership make him quite a successful leader with his high feat the battle of Santa Ines in December 1859. In his march to Caracas he is killed at a minor battle in San Carlos, making a rather ineffectual Falcon the new leader and postponing for several years the issue of the conflict making it as bloodied a conflict as the independence wars were. During that campaign he retook some of the popular and agrarian themes that had made him strong a decade earlier. These helped him greatly in recruiting peasants to man his army. His sudden death of course will leave for ever the mystery as to whether he would have done something about the landless peasants that time around, a doubtful proposition at best. Nevertheless Chavez has chosen to focus only in Zamora populist and popular aspects even if Zamora was quite clearly interested in money and power, at least as much as in freeing peasants. In this respect Zamora was like many a South American strong man, rich in reformist promises, surrounded by lieutenants issued from the humblest social classes, but poor in actual results. However his legend has given Chavez a few of the terms he uses in his revolutionary jargon: "free land and men" (a mision named for that), "general del pueblo soberano" (general of the sovereign people) and of course Santa Ines, the battle cry for the chavista recall election effort. El Nacional also published a graph obtained from the latest national census on agrarian lands. One way to look at it, a way that would favor the government intentions, is to observe that 10 972 families own 60% of the land set for agriculture in Venezuela. That of course would be unacceptable. But is it that number as offensive as some would want us to believe? The first observation that one must make is that the situation is much less grave than it was in 1960. The Agrarian Reform then redistributed a very large amount of estates and did create a new peasant class. Unfortunately this one did not succeed for various reason. One was the very poor support to get started as they often lacked the equipment and seeds and technology that should have accompanied the redistribution. The other, much more important, was the fast urbanization of Venezuela. 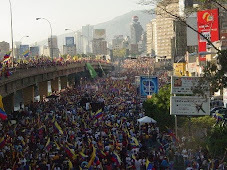 Today barely more than 10% of the Venezuelan population can be classified as rural population. in 1961 the rural population was already down to 37.5% from a 1926 number of 85% living in the country side! After 10 year of oil exploitation Venezuela was still a very rural country in 1926. If in 1926 Venezuela could show some semi feudal aspects, in 2004 this is not a social issue anymore. But let's look a little bit closer at this table from El Nacional. I have simplified it by putting all the numbers in percentages. I have also taken the criteria that to make a living from the land one should own more at least 5 hectares (2.47 acres, so you can just multiply by 2 for a gross approximation if you live in the US). This is very subjective since it depends on the value of the land as an arable estate or a strictly cattle area, on water availability, on the crop, etc, etc... But one must simplify somewhere. Thus the table has been divided into three groups, those that might not have enough land (purple), those that should have enough for a decent living (blue) and those that obviously have a lot, perhaps too much (red). Thus, for example, 25.7% of the rural families own 1.24% of the land which is comprised of properties between 2 and 5 hectares (5 and 12 acres). This particular number is rather bad. However if you regroup the population living in farms whose size should allow them to eek out a decent income (say, to buy a color TV and send kids to school) you will see that 50.7% of rural families own 51.97% of the agricultural land in Venezuela. This, with only 10% of rural population is far from being the searing problem that Chavez would like the world to believe. And certainly not the problem found in Northwest Brazil or other areas of South America. I have also included two areas of overlap. That is, from 2 to 5 through 5 to 10 hectares where the type of crop or breed raised makes the difference between productive or unproductive. The other overlap area, from 500 to 1000 through 1000 to 5000, could represent some lands whose size is a must, in particular in extensive cattle grazing areas in the Llanos were a ranch less than 2500 hectares in certain areas might just not be productive enough. Some Llanos sectors get their only water from rain, for 6 month of the year. In other words, that 50.7% of families who own properties allowing an acceptable income might reach more than 75% of Venezuelan rural population, for almost 70% of the productive land. Of course, this is a speculation as real numbers and rural conditions are not available. Not to mention that there is a profound inequality in Venezuelan land quality. I would much rather own 5 hectares of Yaracuy land than 50 or even 500 hectares of Apure land. In fact, some Yaracuy lands are owned by people from Llanos states who send their cattle to their Yaracuy property for a final fattening before the slaughter house! So, why is Chavez so intent in breaking the land structure? It is important to notice that what would be more useful to ensure the productivity of the Venezuelan country side, what is really needed, would be a large technical program, including education, financing, technology, determination of suitable crops and a real complete census of lands and exact determination of real property titles. But that is too slow a way for people who want flashy results and think that they know it all. Instead,expropriation and setting up cooperatives that would favor a very few percentile points of the population is a preferred method of political promotion. Not forgetting that experience dictates that very few folks in Caracas slums, as in most countries, will willingly go back to the country side. No, the reasons are to be sought elsewhere. One is the need to promote the bolivarian adventure in other countries by creating a fake problem, a code word to rally support elswhere. Another is to destroy a source of wealth for the opposition to Chavez, even if he risks to create food problems in Venezuela (see the Zimbabwe fiasco for a possible Venezuelan future). A more likely explanation is to force the present landholders to sell their land cheaply to the new oligarchic class that Chavismo is creating fast with the state monies so liberally spread around to unconditional followers. And the one that is the most likely objective, is to create a smoke curtain while civil liberties are curtailed. As the "interventions of hatos" is programmed, the gag law gets into effect, a new penal code is voted making it a crime for this blogger to write "Chavez is a jerk", decentralization is becoming a dream of the past, militarization of society advances speedily and new repressive laws are in the books while opposition leaders are facing jail for their ideas.